Scooper - Health News: Do you live in the world's laziest country? Do you live in the world's laziest country? US scientists have amassed "planetary-scale" data from people's smartphones to see how active we really are. The Stanford University analysis of 68 million days' worth of minute-by-minute data showed the average number of daily steps was 4,961. Hong Kong was top averaging 6,880 a day, while Indonesia was bottom of the rankings with just 3,513. But the findings also uncovered intriguing details that could help tackle obesity. 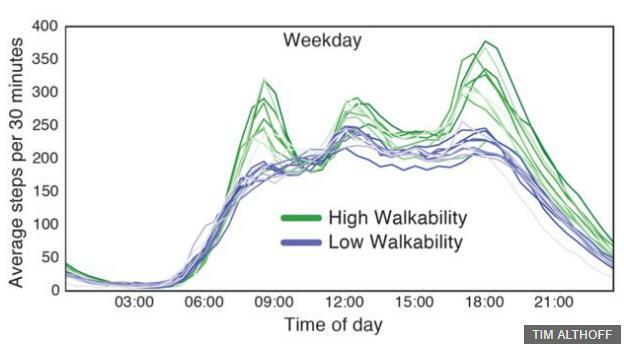 Most smartphones have a built-in accelerometer that can record steps and the researchers used anonymous data from more than 700,000 people who used the Argus activity monitoring app. Scott Delp, a professor of bioengineering and one of the researchers, said: "The study is 1,000 times larger than any previous study on human movement. "There have been wonderful health surveys done, but our new study provides data from more countries, many more subjects, and tracks people's activity on an ongoing basis. "This opens the door to new ways of doing science at a much larger scale than we have been able to do before." The findings have been published in the journal Nature and the study authors say the results give important insights for improving people's health. 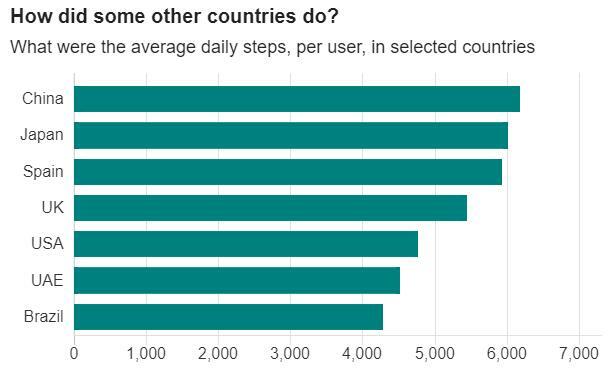 The average number of steps in a country appears to be less important for obesity levels, for example. The key ingredient was "activity inequality" - it's like wealth inequality, except instead of the difference between rich and poor, it's the difference between the fittest and laziest. The bigger the activity inequality, the higher the rates of obesity. Tim Althoff, one of the researchers, said: "For instance, Sweden had one of the smallest gaps between activity rich and activity poor... it also had one of the lowest rates of obesity." The United States and Mexico both have similar average steps, but the US has higher activity inequality and obesity levels. The researchers were surprised that activity inequality was largely driven by differences between men and women. In countries like Japan - with low obesity and low inequality - men and women exercised to similar degrees. But in countries with high inequality, like the US and Saudi Arabia, it was women spending less time being active. Jure Leskovec, also part of the research team, said: "When activity inequality is greatest, women's activity is reduced much more dramatically than men's activity, and thus the negative connections to obesity can affect women more greatly." The Stanford team say the findings help explain global patterns of obesity and give new ideas for tackling it. For example, they rated 69 US cities for how easy they were to get about on foot. The smartphone data showed that cities like New York and San Francisco were pedestrian friendly and had "high walkability". Whereas you really need a car to get around "low walkability" cities including Houston and Memphis. Unsurprisingly, people walked more in places where it was easier to walk. The researchers say this could help design town and cities that promote greater physical activity.